What Is The Best Way To Send Money To India For NRIs? India has the largest population of citizens living abroad, at 16 million NRIs or 1.6 crore Non-Resident Indians. With such a large expat population, it’s no wonder that there is very high demand for money transfer services to India. The top countries from where remittance money comes to India are; US, Saudi Arabia, Canada, UAE, Qatar, UK, Kuwait, Oman, Germany, France, Australia, and China. If you are an NRI looking to send money to your family or friends back in India, then this post is for you. An NRI can either send money from abroad to India or carry it to India and get it converted here. Which if these two methods saves you the most money? Read on to know the pros and cons of each method and also the convenient and cheapest way to send money to India. As mentioned earlier, an NRI can do money transfer from their country to India, or they can carry the money to India and get it exchanged there. Which method to choose depends on factors such as urgency to transfer money, the convenience of sending and receiving money or looking for the cheapest and most economical way to make the cash reach India. Let’s find out the advantages and disadvantages of each method. NRIs can transfer money from their country abroad to India without the money being taxed when it reaches India. The reasons – because of the Double Taxation Avoidance Agreement (DTAA) tax treaty signed between India and other countries. As per DTAA, a taxpayer in a country abroad can avoid paying double taxes on the income they earned from the source country when sending money to their resident country. So let us take a look at the three ways for NRIs to send money to India. NRIs can send money directly from their bank account abroad to the recipient’s bank account in India. This is called Wire Transfer of funds. In Wire Transfer, it usually takes up to 48 hours for the money to get credited to the beneficiary bank account. Your bank abroad will give you a foreign currency – INR exchange rate in which they’d have built up their profit margin. Also, there would be a service cost associated with Wire Transfer. When the money reaches the beneficiary account in India, again Wire Transfer fees might be collected by the beneficiary bank. In return for the higher than average service cost of Wire Transfers through banks, we get a safe and tested method of transferring money overseas. Another way to send money to India for NRIs would be through Money Transfer Companies like Western Union, UAE Exchange, Transferwise etc. Money Transfer Companies allow for more ways of sending money in addition to Wire Transfer to a bank account. For example, using Western Union or UAE Exchange, an NRI can transfer money by simply walking into their centres or doing a bank transfer and handing over the cash to them. This money is then converted to Indian Rupee at the exchange rate set by them. This money can be then instantly picked up by the recipient by visiting their closest Western Union/UAE Exchange centre in India. It can even be delivered directly instantly to the recipient in India. The upside of Money Transfer Companies is that the exchange rates will be more competitive than banks. Also, the speed of money transfer is best here. For an NRI to send money within the same day, this service would be suitable. The downside is that the money saved by the favourable exchange rate may get lost due to the high service cost of cash disbursement. Both Banks and Money Transfer Companies usually offer an online portal to initiate a money transfer to India without needing to physically visit a branch. So if you need to conveniently do a money transfer transaction with a bank/money transfer company, look up if they offer an online portal for the same. Online Payment Systems became popular with the advent of PayPal in the early 2000s. Other notable names in this category are Dwolla, Skrill, Payoneer, Payza etc. Out of the three ways to send money from abroad to India, this is the least recommended by us. Online Payment Systems are notorious for charging customers with highly unfavourable exchange rates. Also, they usually charge a service fee from both the ends, the sender and the receiver. Bad exchange rates + high service fees eat up a significant portion of your transferred money. Another disadvantage of Online Payment Systems is that both the parties need to have an account with them. Unlike bank accounts, which most people have, Online Payment Systems accounts are not so common and it can be a hassle to get one started. So when should you transfer money from abroad to India? When you need to send money immediately to your aged parents or relatives or friends back home. It’s better to opt for money transfer companies as they offer better exchange rates than banks for Wire Transfer. Also, they even have the service to door deliver cash immediately to recipients without bank accounts. For NRIs, apart from sending money from abroad to India, they can also carry the money along with them when coming to India. This money can then be exchanged with banks or money changers when the rates are favourable. This currency that NRIs bring in is not taxed as per DTAA tax treaty. Any person can bring foreign currency to India without any limit. If the money being brought in is in excess of USD 5000 or its equivalent in any other currency (cash) or is in excess of USD 10,000 or its equivalent in any other currency (cash + forex card + travellers cheque) then it must be declared to the Customs authorities using the Currency Declaration Form (CDF). 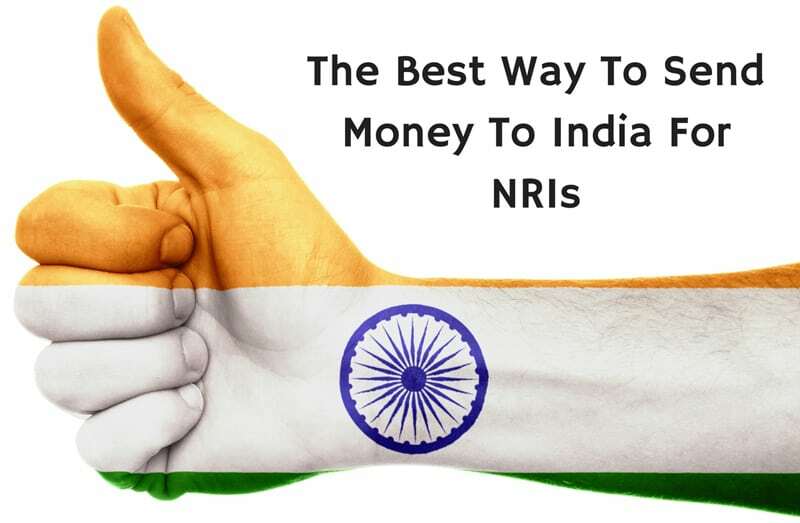 Let us look at the two ways NRIs can get their money exchanged in India. Banks can help NRIs get their foreign currency exchanged for Indian Rupee. The process is fairly simple. Visit your bank branch in India and initiate a sell foreign currency request. For amounts below Rs 50,000 in value, the money can be exchanged and given back directly as cash to the customer. For amounts above Rs 50,000, the amount will be credited to the customer’s bank account. If you have an account in a public sector bank, then it is better to get the foreign currency exchange there as they offer better rates for money exchange than private sector banks. Money changers are RBI approved entities which are licensed to perform forex operations such as currency exchange and/or money transfer abroad. Popular money changers in India are Muthoot Forex, Cox & Kings, Unimoni, Spice Money, Orient Exchange etc. Money changers provide even more competitive exchange rates than banks on the whole since their primary craft is dealing with foreign currencies. The rates will be more favourable to customers and thus they are the preferred choice of many. For banks, on the other hand, this is not their main activity, so the rate which will be used to change your money may be unfavourable. Also, you can enter any money changer store to exchange your currency but the same cannot be said of banks. Please Note: To find out the best exchange rate in their town/locality in India, NRIs can make use of extravelmoney.com’s online forex platform. One can compare the price of different banks and money changers for selling their foreign currency. The bank/money changer providing the best rate for their foreign currency can be found out through the portal. The order can then even be booked online! Thus NRIs can exchange their currency at the best rates in India using extravelmoney.com. So when should you carry money as cash from abroad to India? When you are coming back to India personally for leisure or retiring from NRI life, it’s better to carry the cash with you. Usually, with time, the foreign currency – INR exchange rate gets better for those looking to convert foreign currency to INR. Also, if you compare wire transferring the same amount of foreign currency from abroad to India with carrying it as cash and exchanging it in India, the 2nd method is more profitable! As you can see, in both the cases doing currency exchange in India offers better value for your money. If you are coming back to India either on a short holiday or permanently, it is better to get the money exchanged after coming here. Also, over time, usually the foreign currency – INR exchange rate gets better for the foreign currency holder. Yes, I remember we told at the beginning of this post that there are only 2 main ways to transfer money to India. However, there is a third hidden method that one should never consider using – Hawala transfers. There is a good reason why one should never resort to Hawala transfers – It is illegal! Hawala transfers are based on a partnership between two hawala operators in the sending and receiving countries. A person who wants to send cash back to their country pays the cash to the hawala operator. The operator informs his hawala partner in the other country to release the equivalent cash to the receiver minus their fees. Thus the money gets transferred. Since there is no record of the transaction anywhere and it isn’t a part of the government approved financial services system, it is classified as illegal. So let’s briefly recap the methods of money transfer from abroad to India for an NRI with the table below. It will help you choose the best way to send money to India. Compare each method with how effective it is in fulfilling important factors when sending money such as speed of transfer, cost of transfer and convenience of transfer etc. Money Transfer Companies 1 – 4 days. Faster express money transfer services are also available Lower than Banks and Online Payment Systems Convenient as money transfer companies offer online portals to initiate money transfers. No need for opening an account with them Money credited to the bank account or door delivered to the home of the recipient. Money Transfer companies provide more avenues of funds delivery than banks. Online Payment Systems 1 day Higher than even Banks! Inconvenient. Both sender and receiver need to have an account with the same Online Payment System The money will be credited to the Online Payment System account of the recipient. It can then be held there or withdrawn to the bank account. Banks Same day High Convenient as almost every person has a bank account Bank branches are present almost everywhere in India. Money changers Same day Lower than banks Convenient as you can enter any money changer store and sell your foreign currency. While money changer stores are not as widespread as bank branches, you can still find money changer stores near you offering good exchange rates using extravelmoney.com forex aggregator platform. We hope you found this post informative and engaging. Any doubts or insights that you wish to share can be addressed in the comments below. Also Read: NRE vs NRO account for NRIs- What’s the difference & How to choose?